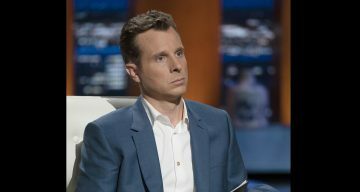 Jamie Siminoff will appear as a guest shark in season 10 of the popular reality TV show, Shark Tank. He is the CEO and chief inventor of his company, Ring, which was bought earlier this year by Amazon for around $1.0 billion. Many are curious to know more about Siminoff’s personal life. So, here are some details about Jamie Siminoff’s family. There is a new Shark in town, and his name is Jamie Siminoff. That’s right! Siminoff will be the new guest investor shark to appear on Shark Tank season 10, which kicks off on October 7, 2018 on ABC. The Sharks didn’t get hooked on Siminoff’s idea, and then the most unexpected thing happened. Billionaire Virgin founder Richard Branson teamed up with Siminoff and worked with him to develop his innovative product! Siminoff changed the name of his company from “DoorBot” to “Ring” and sold it to Amazon for over $1.0 billion in 2018! No wonder he is back as an investor on Shark Tank season 10 with loads of money, looking for the next breakthrough idea. Jamie Siminoff, age 41, was born on October 18, 1976. He currently lives in Los Angeles, California but his hometown is Chester, New Jersey. Siminoff completed his high school education at West Morris Mendham High School in Mendham, New Jersey and Morristown-Beard School in Morristown, New Jersey. He later studied entrepreneurship at Babson College in Wellesley, Massachusetts. Currently, Siminoff is the chief inventor and CEO of his Santa Monica-based company called Ring, which he launched in August 2013. Ring is a global home security company now owned by Amazon. It manufactures a wide range of home security products, which use outdoor motion-based cameras and doorbells that allow users to monitor and operate their front, back, and garage doors remotely. Siminoff is married to a wonderful lady from Indianapolis, Indiana named Erin Lindsey. She studied at Louisville High School in Woodland Hills, California and graduated in 1997. She then enrolled at Pepperdine University in Malibu, California. Shortly after graduating from university in 2001, Lindsey got a job at 20th Century Fox Films, where it looks like she still works today. She has worked on many films over the years like The Fault in Our Stars, The Hate U Give, Stuck in Love, Hidden Figures, Alvin and the Chipmunks, and Life as We Know It. The couple has one child, a boy named Oliver Siminoff. Jamie Siminoff’s son is loving called Ollie by those who are close to him. Despite their busy work schedules, both parents make sure that they spend as much time as possible with Oliver. He’s quite literally the apple of their eyes. Siminoff credits his parents for encouraging his incredible ability to conceptualize and invent all kind of gadgets and products. When Siminoff was a kid in Chester, New Jersey, he would spend all his time in his parents’ garage making things that he shouldn’t … like explosives! He constantly injured himself while working on his inventions, like the time he made a homemade knife and later accidentally stuck it through his arm. His parents were appalled, to say the least! However, there was a time when Siminoff struggled with his grades in school. But everything changed when he saw the Land Rover Defender 90. He fell in love with the SUV, and his astute father realized that it was an opportunity to motivate his son. He told Siminoff that he would buy him the Land Rover if he got straight A’s. From then on, Siminoff worked hard at his studies and started getting A’s in all his subjects. His father kept his end of the deal and bought the SUV for Siminoff. Later, when he grew up and started his career building innovative products, it was his wife who encouraged him most. Today, Siminoff is a busy man with a family to take care of and a multi-million-dollar company to run. He spends most of his time coming up with innovative and radical ideas for products that will make an appreciable difference to his customers’ lives. Jamie Siminoff is a successful modern-day entrepreneur, and he would be the first one to tell you that he couldn’t have done it without his loving family. Look for him next on Shark Tank this season on ABC, as he gives advice to the next generation of inventors!